RID Pest Control aim to make paying your invoice as straight forward and easy as possible. All of our units on the road are equipped with EFTPOS terminals supplied by Westpac. 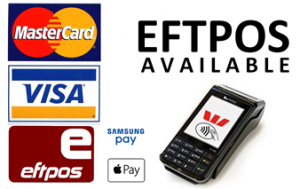 You can make card payments using eftpos, Visa, Mastercard, Apple Pay & Samsung Pay. Our standard terms are payment on the day of service. The standard terms apply for all domestic and residential clients, however, in some circumstances we may issue an account with strict 7 day terms. All vacate treatments (fleas/general pest) being paid for by the departing tenants must be paid before work commences / before issuing of paperwork for your real estate agent. Pre Purchase Pest Inspections can be pre paid or paid within 7 days by account before the report will be released to the report requester. Commercial and corporate accounts are provided with a default 7 day term unless otherwise agreed where terms can be provided up to 30 days for routine commercial accounts. Please note: A Free Service Period or Warranty will NOT apply until invoices are paid. All payments can be made using the details provided on the right side of this page. RID Pest Control is without doubt the FIRST pest control company to accept any crypto currency as payment for services. We accept Bitcoin (BTC) at current market rates as payment for our services. In order to make payment with Bitcoin please speak with your technician who can provide a receiving address for your BTC transfer. Reference: Invoice number or your last name. Please phone us on 0414 567 977 and our friendly office staff will help you with making a payment by credit card over the phone. If you prefer, and want us to pick up your cash payment please call us to arrange a pick up date and time. Please DO NOT send cash by mail. We accept cheque payments by prior arrangement only. Please contact us before sending a cheque so we can confirm it will be accepted and we can pause overdue reminders from being sent. Be sure to provide a copy of the invoice being paid in your envelope.